Grilled Pineapple Chicken is marinated in a sweet and tangy sauce full of BBQ sauce and pineapple juice. 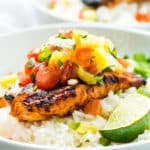 This BBQ Pineapple Chicken is then topped with pineapple pico de gallo for an easy, low-carb, and healthy weeknight dinner recipe! With Springtime in full swing here in Texas, we have started to get our grill going and this BBQ pineapplee chicken was one of the first things to hit it! Unlike most of you up North, springtime in Austin, TX is one of two times in the year where the weather is absolute perfection. Highs in the upper 70s/low 80s and the lows dipping down to the low 60s/upper 50s at night. Couldn’t get much better! Grilled Pineapple Chicken Recipe at the Brazil Casa! The Spring weather also brings with it TONS of super fun activities. Cohl and I like to frequent Barton Creek multiple times per week, and often find ourselves encouraging friends to go hang out with us there instead of at a restaurant. After all, why go to a restaurant when you can come over to the Brazil casa and load up on tons of this Grilled Pineapple Chicken with BBQ Sauce?! What Should I Pair with this Healthy Pineapple Chicken? A few days ago I gave you a recipe for this amazing Pineapple Pico de Gallo. 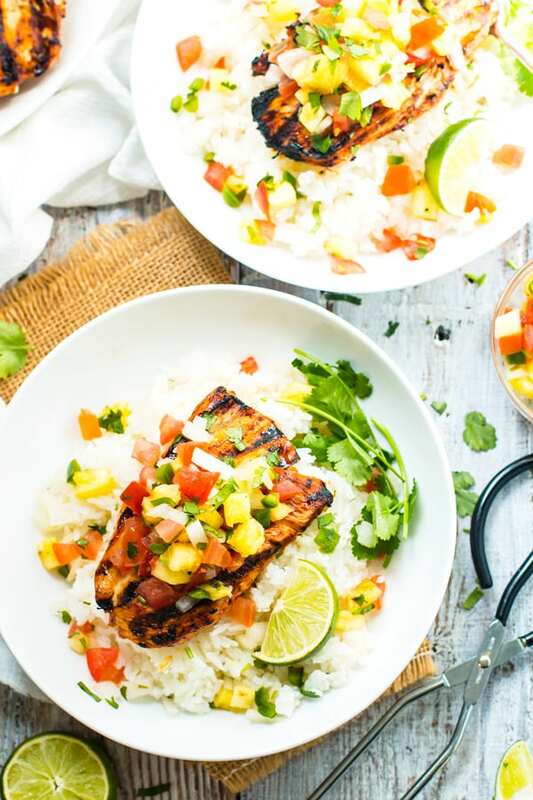 While you can definitely enjoy this pineapple pico de gallo recipe by the scoopful, it also tastes INCREDIBLE when it is loaded on top of this grilled pineapple chicken. 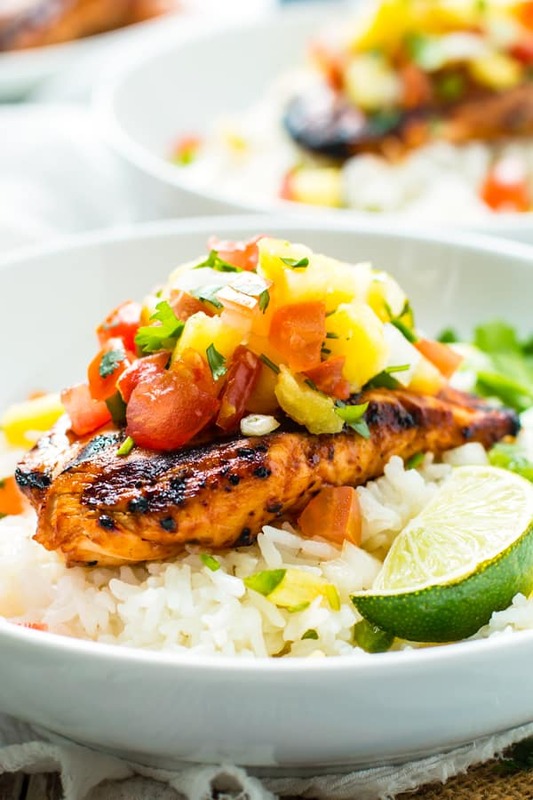 If you like you like to have a dip to douse your grilled pineapple chicken in, go ahead and make 1.5 x the recipe below for the pineapple BBQ sauce. Take the extra 10 minutes to trim off the fat and give your chicken a good pounding. Trust me, it makes the chicken extra juicy! Make sure to marinate your chicken for AT LEAST 30 minutes and up to 2 hours. Try not to use a BBQ sauce with too much sugar in it since the pineapple already delivers a good bit of sweetness to the chicken! 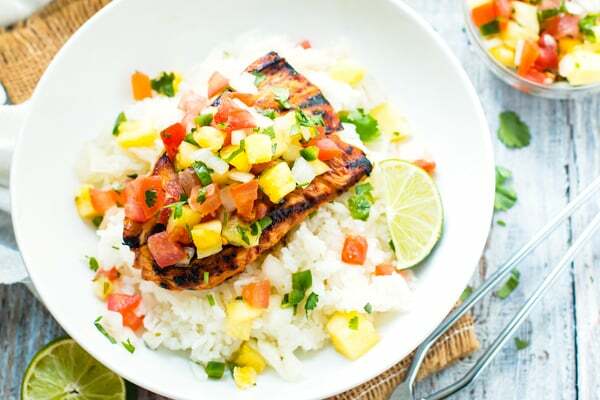 Our favorite way to eat this grilled pineapple chicken is to serve it over a bed of jasmine rice and with a few lime wedges. However, if you are on a low-carb or Paleo diet, feel free to eat this grilled pineapple chicken over cauliflower rice or in a lettuce wrap. 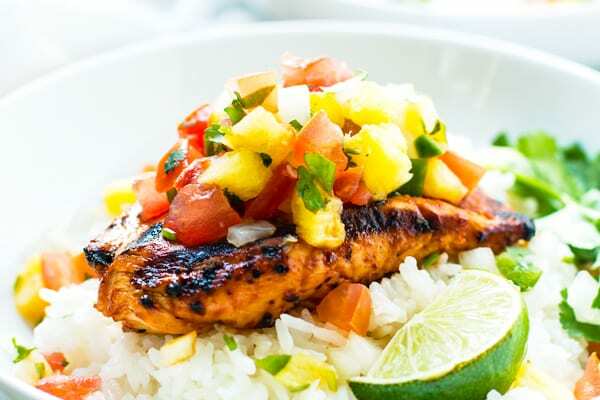 Either way, this BBQ pineapple chicken makes a super light and refreshing dinner recipe that is perfect for these warmer months! In a medium-sized bowl combine all ingredients, except for chicken. Whisk to combine. Place chicken in a one gallon zip-top bag. Reserve ¼ c marinade and pour remaining marinade over chicken. Place zip-top bag full of chicken in refrigerator for at least 30 minutes, and up to two hours. Cook chicken directly over heat for 3-4 minutes per side, or until a meat thermometer reads 155-160°F. Baste chicken with reserved marinade while grilling. 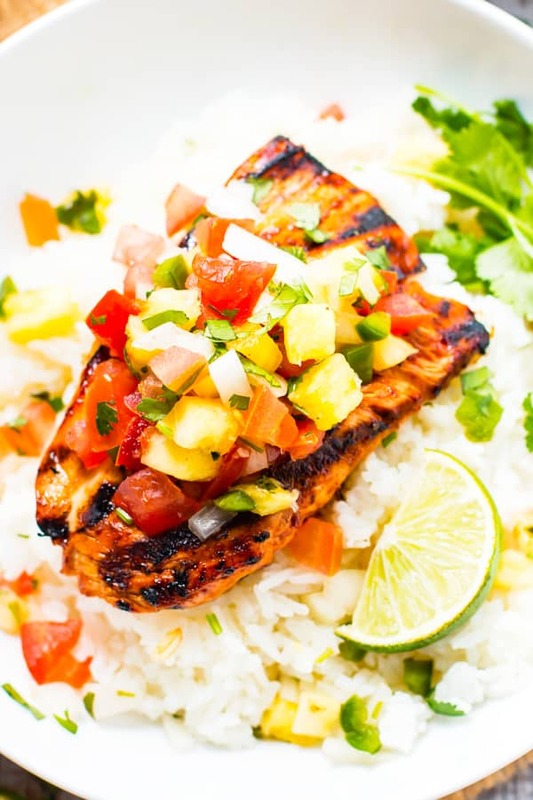 Serve grilled pineapple chicken over rice with pineapple pico de gallo. *Can get this from a can of pineapple but you can also use orange juice. **Depending on the desired spice level. Want more recipes like this Grilled Pineapple Chicken with BBQ Sauce? My mouth is watering. It’s not quite spring here in the North East but I will definitely be saving this recipe for when we finally do get to grilling weather!